backs in the early printing of the 350 series but that might not be the case. leaguers ran on August 13 1909. The first known ad that mentioned the southern leaguers ran on August 23 1909.
newspaper beginning on August 14 1909. Last edited by Pat R; 10-10-2018 at 12:38 AM. Pat - Your research is INCREDIBLE!! Pat--Terrific research and thanks for sharing. I have a piece on Southern League players at Scot Reader's invaluable website, T206insider.com. If I revise my essay I will most certainly have to mention the OM/Hindu connections. Awesome Pat, thanks for sharing. Looks like Eli Witt was quite the seller of tobacco products. 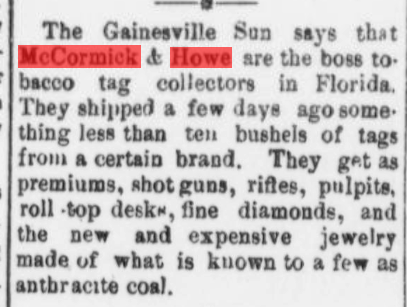 This link was sent to me several years back from Chris Browne who found it for me, leading me to believe it was pretty easy for Howe to amass a large collection if that many folks were buying cigarettes from his family store and maybe just giving them to him or leaving them behind. But what are tobacco tags? Would these have had anything to do with either the Piedmont, Old Mill or Hindu brands? Or are these from loose leaf tobacco for those who rolled their own? Thanks Howard, Mike and Bryan. and I read it again today very informative and well done. the 2nd president of the Southern Baseball Association. like stamps that could be exchanged for merchandise. Great information always Patrick! Thank you. This is awesome! Thanks for posting Pat! An original T206 collection from South Carolina, which I acquired back in 2006 of approx. 400 cards essentially reinforces your research. from his Grandfather, who he said collected them in his youth exclusively in 1909.
mirrored the Hindu and brown Old Mills and were lacking the same 14 subjects. I was thinking the same as you are; and, I have searched for my list of those 29 - OLD Mill Southern Leaguer's. But, so far have been unable to find it. I will keep on searching. Good information thanks for sharing. Always like hearing more about the Southern Leagues! grew up in South Carolina (and apparently his father strictly enjoyed Piedmont Cigs). are Ex.....a well preserved collection with many HOFers. " information regarding them. Although, I do recall this SL group included Breitenstein, Shaughnessy, Foster, and Revelle. Thanks for checking Ted. It would have been nice to know the 26 OM SL players since they all came from an original South Carolina collection. I think it's interesting that the 1909 Eli Witt ad specifies "players of the Southern and South Atlantic Leagues". ads in Texas papers compared to the Old Mill ads from all the other states. only mention that they contain baseball pictures. I'm still going through all the ads and when I finish I will post them. includes the statement of the Texas League players. that used the same picture ran a month apart. Last edited by Pat R; 10-11-2018 at 10:03 PM. Sporting Life, Hindu, Old Mill and Piedmont ads. The Old mill gallery has 26 different ads. add some new information to theirs. that made no mention of baseball pictures. Last edited by Pat R; 10-13-2018 at 03:24 PM. Scot Reader wrote about the Southern Leaguer's in his inside T206 publication. to December 9 1910 only mention Texas League players. printed separately from the other 42 Southern League players. Very interesting. We of course have known for a while that 34 of the 48 SLers were printed with Brown Hindu, and that none of the six Texas Leaguers were among the 34. The August 1909 Old Mill ad you found suggests that printing of these 34 with both Brown Hindu and Old Mill Southern started sometime in the late summer of 1909, whereas it had been previously thought that Old Mill Southern printing of all 48 SLers started at a later time—perhaps early 1910. In my view, this finding also reinforces the importance of the number 34 in T206 printing. Nice work. Last edited by sreader3; 10-17-2018 at 09:25 PM.